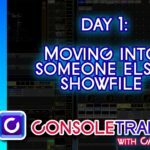 – The Consoletrainer 2018 showfile (Includes our updates from Day One) so you can play along. Welcome to day two of 18 in 2018. Today, we’re going to clean up our layouts, and color code our fixtures to help us move more quickly while programming. 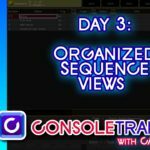 If you’re playing along and don’t have the showfile, download it on consoletrainer.com or in the YouTube description. I’ve included our edits from Day One in the download, in case you missed yesterday. Lets all take a moment here and backup our show, updating the name to reflect that this is Day Two. Great. Now, we’re primarily going to work in Screen 2 today- the screen above your encoder wheels. Here we have views already for Stage, Groups and Layout. We currently have no layouts, so we’re going to make one. I recommend building your stage before making the Layouts, because the Layouts will allow us to pull location information right from our Stage. I’m going to add a small Groups window at the bottom of the Stage View and also the Layout View… just to make things easier. In our Groups pool, we have our Sharpys, Auras, Vipers and Quantums. I want to select all my fixtures to put into our Layout, so I’ll click the “ALL” Groups for each fixture type. Now, hit STORE and click the first empty Layout block. You can immediately go ahead and rename it. We don’t see anything yet, because this view will update to the selected Layout and right now, nothing is selected. So, click on your new layout. Right now, all of our fixtures are sitting there in a line. I want to make this layout look more like a lightplot, so I’m going to use the information from the Top View of my Stage. First, make sure all of your fixtures are selected in yellow. If not, just click and drag over all of them to select them all. At the top of the Layout View, hit “Setup.” At the bottom of the screen, click “Arrange.” In the new menu, we want to click Camera. The lights have already moved… but this isn’t quite the view that I want, so on the encoder wheel (You can tap or turn), locate “Top” then click “Apply.” Cool, now our units are arranged as if we were looking down on the stage. If you click “Zoom to Fit,” it will center them up. Because we used the Stage Camera, some of our fixtures are different sizes. If you want them all to be uniform, select them all, click “Element Properties” to get us back to the encoder options, click “Position” and change the “Size All” encoder to something like .5. Doing this isn’t necessary, but I certainly prefer it. Something I don’t particularly love to see is the grid in the background. It’s helpful when setting up, sure- but I just don’t love it. If you’re like me and you want to get rid of it, click the yellow ball at the top of the Layout Window. In the new menu, under “Layout Data”, click on either the Grid X or Grid Y (Doesn’t matter which) and change the number to zero. Boom, no more grid. Last thing that I want to do is color code by fixture type. I’m really not big on seeing rainbow colors all over the console- but this is one thing I will assign colors to- just to make locating fixtures easier and faster. This showfile has a small rig, but when you’re working with large scale, arena rigs… I find color coding to be very useful. Let’s start with our groups. In this example, I want the Sharpys in the pool to be coded as pink. To do this, hit the ASSIGN key three times until you see the word “Appearance” on your command line, then click the GROUP key followed by the numbers 1 THRU 3 PLEASE. In the PopUp window, I’ll pick a Magenta color, make sure the brightness is high and click please. Now, my Sharpys have a magenta outline. Lets do the same process for the other types. Hit ASSIGN three times, press GROUP 4 THRU 5 PLEASE for the auras, and lets make them red. Same process for the Vipers and Quantums. You don’t HAVE to use the colors I’m using- but I do recommend not choosing yellow- because when we color code our Layouts, yellow represents a selection, so it can be confusing. So, now we’ve colored our Groups pool, but nothing has changed in the layout- we have one more step. Lets make sure our Programmer is CLEAR, and then select the Sharpys. Make sure you’re in SETUP in the Layout view, and we want to click the button to change our encoders until you see the color options. Click on “Border Color”, lets pick that same Magenta and we’re there. Same thing for the rest of the units. Make sure to Clear out in between and just follow the color coding you already established in the groups pool. Once you establish a color coding system that you like, you can also choose to apply it to some of your presets. I think the one that makes the most sense to me is your gobo pool- since the gobo wheels are unique to fixture type. I’ve already set the Sharpy and Viper Gobo presets to the colors we just applied to their groups. The idea here is just simple, visual organization. The more organized we get, the faster we become.